The Rebel Sweetheart. 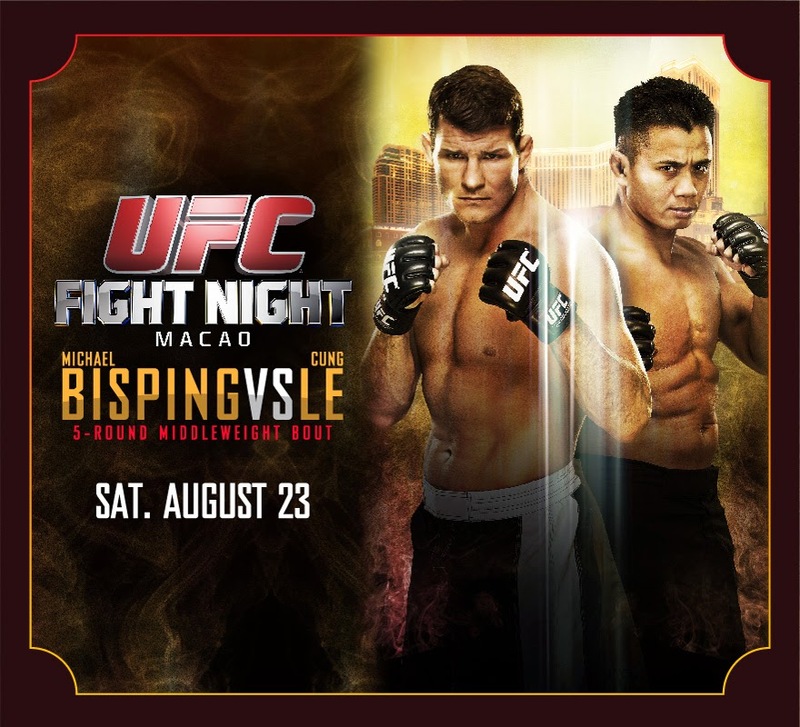 : UFC Fight Night Macao | Le vs Bisping. Macao will once again see some hard-hitting mixed martial arts action, as the UFC returns to the Cotai Arena for a showdown between two top 10 contenders in the middleweight division. Former Strikeforce champion Cung Le (9-2 in his professional mixed martial arts career, fighting out of San Jose, California), makes a comeback after a two-year hiatus that saw him serve as a coach on The Ultimate Fighter China, the organization’s long running reality series, as well as further his action movie career. In his return to the Cotai arena, Le will look to build on his reputation as one of the most exciting fighters in combat sports history when he meets Manchester, England’s Bisping (24-6, fighting out of Orange County, California) in the Octagon. For Bisping, a win over Cung Le would mark his first victory over a former champion, which could possibly lead to another shot at the middleweight title. Kim and Woodley stare down at the weigh-ins. 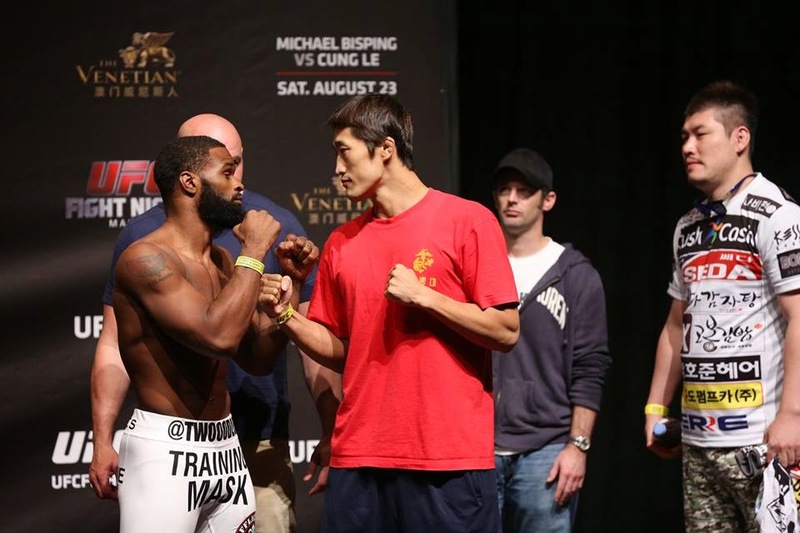 In the co-main event, 'Stun Gun' Dong Hyun Kim (ranked no.9 in the welterweight division) will go up against no.4-ranked Tyron 'The Chosen One' Woodley. This fight has quite a divisional significance, as well as major world title implications. A well-rounded mixed martial arts fighter, Kim has a ton of momentum after crushing victories over John Hathaway and a knockout of the night performance against Erick Silva. Woodley, on the other hand, is potentially one huge win away from a shot at UFC gold. Both fighters will be looking to cement their place among the elites in the welterweight division. Also included in the main card are Yang Jianping and Ning Guangyou - who will battle to become the featherweight winner of The Ultimate Fighter® China and win the coveted UFC contract. UFC Fight Night Macao will be held on August 23, 6 in the evening at the Cotai Arena, Venetian Hotel. This is a sport I know NOTHING about--I'm glad you find it so entertaining. Oh, UFC!! these fights are so darn entertaining! Good luck to both fighters (well, all fighters since there will be a few other fights before the main one). My husband and two oldest (grown) boys like to watch the fights. They can be pretty exciting sometimes. I am definitely not into watching fights. As a matter of fact back when I used to watch TV if fights came on (World Wrestling I think it was called) I just turned off the TV and picked up a book!